Mental and emotional strength is very important to fight Cancer, but financial strength is just as important. While fighting Cancer is not easy, being financially prepared for it is. PROTECT YOURSELF FROM THE RISING COSTS OF CANCER CARE.GET COVERED IN A FEW SIMPLE STEPS. 7 day survival period between the date of diagnosis of a condition and the date eligibility for a benefit payment would be applicable. Sexually Transmitted Diseases AIDS or HIV. Signs or symptoms (related to the diagnosed cancer) first occurred during the waiting period. Please refer to product brochure for detailed benefits. 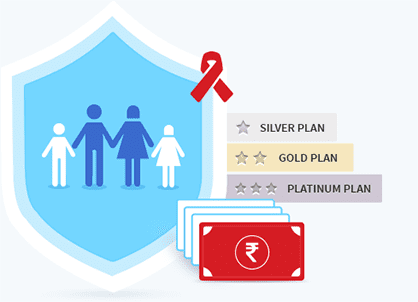 What is the HDFC Life Cancer Care Policy? HDFC Life brings to you a comprehensive Cancer Care plan that provides financial protection for both early and major stage of cancer. This is a plan that not only gives pay outs but also a waiver on premium for the next 3 policy years on diagnosis of early stage of cancer. There is an increased benefit where the Sum insured under the policy increases every year under the Gold and Platinum option. Also, offers an income benefit under the Platinum option. Why do I need the HDFC Life Cancer Care Policy? Under Gold and Platinum option, the Sum Insured will be increased by 10% every year. This will continue till the increased Sum Insured becomes 200% of the Initial Sum Insured or if any claim is done whichever is earlier. Provides tax benefits on premiums paid up to Rs 55,000 under Sec 80D of the Income Tax Act, 1961. There are 3 plan options available in this product namely Silver, Gold and Platinum. The base benefit is applicable on all the 3 options. The Increased benefit is applicable on Gold and Platinum options where as income benefit is applicable only on the Platinum option. There would be discount in the form of lower premium rates for incremental Sum Insured over & above Rs. 10,00,000. The premium paying frequency available for this plan is Annual, Half-Yearly, Quarterly & Monthly. If I don't claim any amount, then will my Sum Insured limit increased in the subsequent year? Yes, the sum insured limit will increase from the subsequent year but this increased benefit is applicable in case of the policyholders who have chosen the Gold and Platinum plan. Under this benefit, the Sum Insured will increase at a rate of 10% of the Initial Sum Insured per annum starting from the first policy anniversary. Once the claim is made, all future claims shall be based on the Increased Sum Insured at the time of first claim. Further increases to the increased Sum Insured shall not be applicable. How will the Pay Out happen for this plan? Payout will be depending upon the plan Option chosen. Gold Option: Under this option the policyholder receives the benefits described under the Silver option plus an increased benefit. Once the claim is made, all future claims shall be based on the Increased Sum Insured at the time of first claim and further increases to the Increased Sum Insured shall not be applicable. Under this option the policyholder receives the benefits described under the Gold option benefit plus regular Income Benefit. Under Income benefit option a monthly income equivalent to 1% of applicable Sum Insured would be paid out to you on diagnosis of the listed major cancers for a fixed period of next 5 policy years. The minimum cover for the policy is Rs.10 lakhs whereas the maximum cover for the policy is Rs.50 lakhs. Reema# is a young and vibrant individual. She has never smoked and lives an active and healthy life. For a few days, Reema had a terrible cough, and started experiencing shortness of breath. She went for a check-up, where she was diagnosed with lung cancer. While the cancer was caught early, Reema's medical insurance did not cover the cost of her treatment. As Reema's health was on the mend, her savings were completely wiped out, and she was forced to build her savings from scratch once again. We all hear stories like Reema's, but we always believe that cancer is something that happens to others, and never affects us. Unfortunately, this is not true. According to a recent research more than 1 million cancer cases are diagnosed every year1. By 2020 Cancer cases are expected to rise by 20%. The number of cancer cases in the country is definitely increasing; and breathing in polluted cities like Delhi and Mumbai has been said to be as bad for you as smoking a packet of cigarettes every day. If not treated on time cancer treatment can be expensive. Over 45% of families drain their savings for cancer treatment. Very few health insurance policies will cover diseases like cancer, and cancer treatment drugs can cost up to Rs. 8 lakh*. Keeping this in mind, it's a good idea to opt for a comprehensive plan, like the HDFC Life Cancer Care plan, over your regular health insurance, which will take care of your finances, leaving you free to focus on your health. #The name and character of Reema is used in a fictitious manner. Any resemblance to actual person, living or dead, or actual events is purely coincidental. Cancer is the kind of disease that requires medical care over a very long period of time. Recurring medical costs are quite draining, and cancer treatment can completely wipe out an individual's life savings. Insurance companies have understood the need to provide comprehensive cover, and a number of insurance policies are now available that are especially crafted for people who are at a high risk for cancer, as well as for people who are health conscious and regularly go for cancer screening tests. As with diabetes, cholesterol, high blood pressure and a number of other heredity diseases, constant screening is the easiest and fastest way to detect cancer while it's still in its early stages. If cancer is detected early, the treatment is not only less costly, it is also more effective. A good medical insurance policy will generally cover the costs for an ambulance, hospital room charges, and the doctor's fee if the insured person is required to be admitted for treatment. Unfortunately, most health insurance policies will not cover expensive treatments such as cancer treatment. At the end of the day, you are the best judge of your medical needs. While it is important to have a regular health insurance plan in place to cover hospitalisation costs, you need to decide whether you need a cancer care plan based on various factors.